Why don't walls with corners layout in even foot dimensions? Home » Asked & Answered: Why don’t walls with corners layout in even foot dimensions? Why don’t walls with corners layout in even foot dimensions? This is an interesting question we receive occasionally from designers, engineers, and builders. It is possible to create a building that will have even foot dimensions. This is typically achieved by shortening blocks at some other point in the wall away from the corners since corners are one of the greatest challenges in any type of construction. A number of factors, from a product design perspective come into play when creating modular products that will be used in multiple ways and scale. A few challenges include: molding constraints (limitations on the design of the mold and moving parts within it); web placement and spacing; thickness of the EPS panels; and the variety of core thicknesses we offer. If a design is made to fit one core width and end on an even foot dimension, it would be off by 2 inches for the next larger or smaller core width. Additionally, the webs have a width requirement that is imposed by the attachment strips, preventing them from being placed too closely to each other. Likewise, if a corner form was an even foot dimension on the outer panel, the webs for the inner corner would not be accessible for drywall attachment. Once the webs are aligned, they are limited to 6” increments each direction provided that one of the legs is 12” longer than the other. The short leg has 2 webs and the long side has 4 webs to provide to provide adequate support during a pour. The forms are 9”, 11”, 13” etc. wide (core width plus foam panel thickness) which also throws off the use of even foot dimensions even further. BuildBlock ICFs are optimized for use in a variety of designs. The blocks scale and web and attachment points align across different sizes, even in the same wall. This compatibility was carried through all BuildBlock designs including BuildBlock ICFs, BuildLock Knockdown ICFs and GlobalBlock All Foam ICF. BuildBlock spends a great amount of our product design resources making sure that our products fully integrate together into a system that can be used to build any structure. 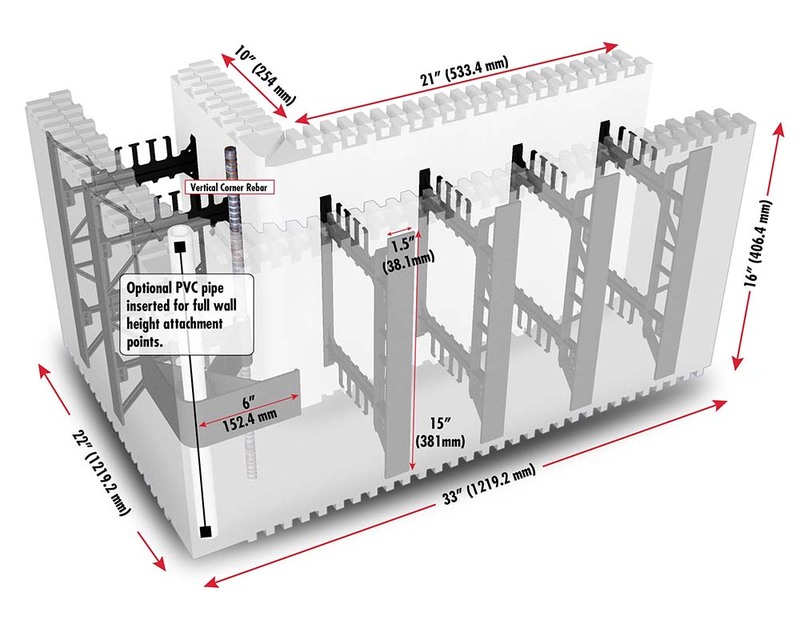 The ability to adjust a block length by increments as small as 1-inch and still utilize the block interlock creates the most versatile ICF on the market and reduces waste. This also allows quick stacking and layouts of complex home designs.